A new study of permafrost has found that the ice wedges forming the prevalent honeycomb pattern across the tundra appear to be melting rapidly across the Arctic. 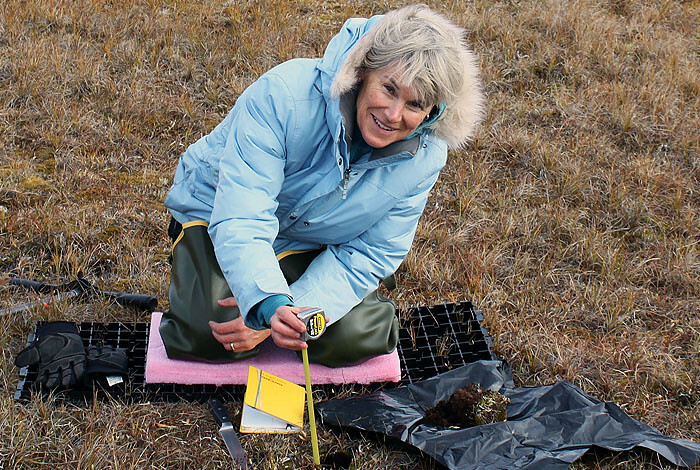 Los Alamos National Laboratory scientist Cathy Wilson measuring how soil properties change with depth at the DOE Next Generation Ecosystem Experiment, NGEE-Arctic, field site near Barrow, Alaska. “Change is happening so fast. I never thought I’d see thermokarst occur over the course of a few years at our field site. It’s pretty exciting, but scary too.” Wilson said. LOS ALAMOS, N.M., March 15, 2016—A new study of permafrost has found that the ice wedges forming the prevalent honeycomb pattern across the tundra appear to be melting rapidly across the Arctic, changing the hydrology of the region and accelerating the release of greenhouse gases with major implications for global warming. While the gradual warming of permafrost has been well documented in the Arctic, a new study published this week in the journal Nature Geoscience indicates that a brief period of unusual warmth can cause a rapid shift. Focusing on the polygon ice troughs associated with wedges of ice that thrust deeply into the ground, the study found the ice wedges are quickly melting, amplifying the loss of permafrost by altering the storage and movement of water. Permafrost is continuously frozen ground for two-plus years, with most of it frozen for tens to hundreds of thousands of years. Hundreds of meters deep in many places and frozen for millennia, it covers nearly 24 percent of the Arctic and stores nearly 1,700 gigatons of organic carbon, far greater than the amount of carbon already in the atmosphere in the form of the greenhouse gases methane and carbon dioxide. Permafrost has been thawing in recent decades and releasing greenhouse gases. Wilson and other Los Alamos scientists have been working to understand how changes in permafrost hydrology might alter the Arctic carbon cycle, including the possibility of a large-scale greenhouse gas release from thawing permafrost. Ice-wedge degradation has been observed before, but this is the first study to determine that rapid melting of ground ice has become widespread throughout the Arctic. The research team predicts that the melting—already occurring at sub-decadal timescales—will expand and intensify across the region, and this could escalate global warming and create more feedbacks. Wilson explained: “When permafrost thaws, microbes get active and start decomposing the carbon in the soil. This generates greenhouse gases. We want to know how much gas will be produced, how fast it will be released from the soil, and if it will be methane or carbon dioxide. Hydrology is critical, because more thermokarst ponds result in more methane, but more drained land results in more carbon dioxide.” Methane traps 25 times more atmospheric heat than carbon dioxide does on a 100-year timescale. The international team combined observations about the types of ice wedge polygons and how they changed over time across the Arctic, where the team was already performing various permafrost studies. According to the paper, although these regions contain “cold permafrost,” with an overall average temperature of about minus-14 degrees Celsius, surface thawing still occurred at all of the 10 study sites across Alaska, Canada, and Russia. At the studied sites, ice wedge degradation occurred in less than a decade. In some cases, a single unusually warm summer was enough to cause over 10 centimeters of surface subsidence. The team’s synthesis of field observations, remote sensing, and hydrologic modeling documents trough formation (from melt and subsequent water movement) across the Arctic continuous-permafrost domain. Marine-Earth Science and Technology; Arctic National Wildlife Refuge; Russian Academy of Sciences; Southwest Research Institute; Hydrology Software Consulting; San Diego State University, Earth Cryosphere Institute; and the University of Sheffield. This research is funded by Department of Energy’s Office Science (Office of Biological and Environmental Research, Next-Generation Ecosystem Experiments, NGEE-Arctic). 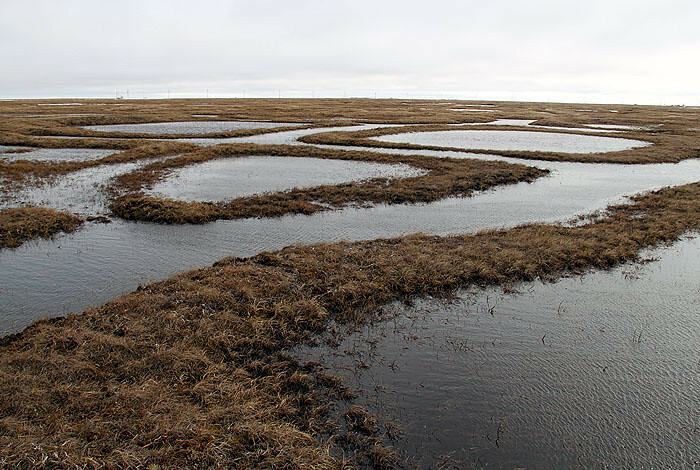 Caption for image below: Ice wedge polygons impound snowmelt runoff at the DOE Next Generation Ecosystem Experiment field site near Barrow, Alaska. Thousands of square miles in the Arctic are covered by an interconnected network of ponds in polygon formations. Recent research reveals rapid and widespread degradation and melting.